Galls are found on many tree species including Spruce, Poplar, Aspen, Alder, Beech, Cottonwood, Elm, Linden, Oak, Maple and Walnut. 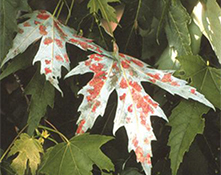 Gall-producing mites commonly seen include Maple Spindle Gall, Maple Bladder Gall and Erineum on Maple. Galls are distorted, sometime colorful swellings in plant tissue. 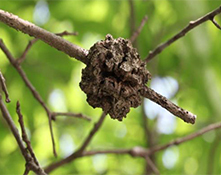 These unusual growths may be found on branches, flowers, leaves, trunks or twigs. There are many potential causes for galls, including nematodes, parasitic plants, and pathogens. Secretions of certain plant feeding insects and mites also induce distorted growth in plant tissue. 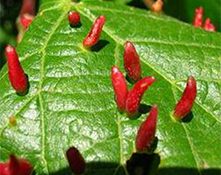 Gall-producing mites are responsible for producing galls and dense patches of hair or beadlike growth called erinea on the leaves of a number of plants. Galls are caused by many different invertebrates; adelgids on Spruce, aphids on Poplar, gall mites or eriophyids on many hosts. Gall development is poorly understood, but larval secretions induce abnormal growth of cells in the plant. Many galls harbor a single, legless larva and other galls may harbor several larvae, some of which may be different species that are predators or parasites of the gall maker. Treatment is not usually necessary as lasting harm to plants rarely occurs. Prune and dispose of galls if they are annoying. This may provide control of some species if pruning is done when the immature are in plant tissue and before the adults begin to emerge. Horticultural oils may help to reduce populations of some gall makers. Maintain good plant health.